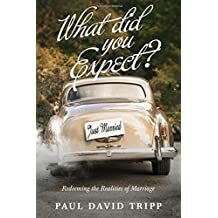 Whereas most books on Christian marriage examine the limited passages from Scripture that deal specifically with marriage, Tripp takes a much broader perspective -- applying theology across the board to the marriage relationship. He shows why expectations are always disappointed, how new realistic expectations can be built, and why that is ultimately a good thing. Among many good books on marriage currently available (Eggerichs, Keller, Piper), this ranks very high on the list.